I tried with 27C010A EPROMS but I have also 27C1000 if needed (and 27C256 28 pin). Also AM27C010 but are the same as the 27C010A. I did the schematic posted using 2x 32 pin sockets to avoid soldering the EPROMs pins. On the Mega ST is a lot of free space . So, there are 3 sockets: one 28 Pin attached to the motherboard, one 32pin with the lower pinout rerouting, and one 32 pin with the upper pinout rerouting. I splitted the TOS.img in HI and LO files with ROMSPLIT app under Hatari . The Mega 4 has TOS1.4 German in two chips. I tested it with TOS1.4 UK in two chips and worked ok too. Yes, that's thes scheme I followed. The one from Exxos. As I said, two sockets were used to avoid soldering on the EPROM directly. It is important that do some things with W2-W4 pads. "On pic above is how it is solved in Mega ST. 32-pin sockets are inserted in original ROM sockets, so that pins 1, 2, 31, 32 are in air. Pins 30 are cut down, and is best to put little insulator between them and sockets, to avoid contact. Of course, if not using Flash EPROMs and don;t want in circuit programming, you just connect +5V to point 2 of W2 - what leads to OE pins. And another not to do is: do not cut (desolder) pin 12 of 74LS11 - it is needed if no additional logic. 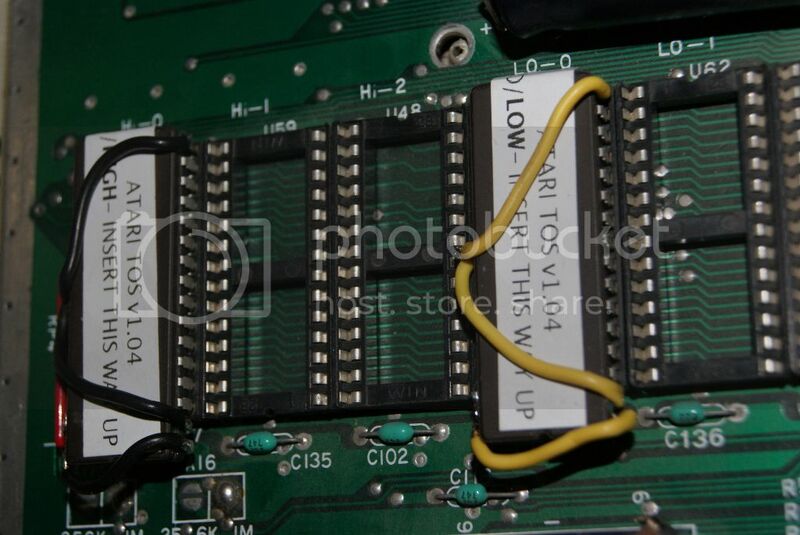 Pin 31 of EPROMs go to +5V, of course.